Today I am posting a wedding card that I designed for The Susan Tierney Cockburn Design team at Elizabeth Craft Designs. I used Susan’s Garden Rose 2 die, Katie Flourish Frame Edges, Accordion Oval Card Die and Heartstrings Embossing Folder which all can be found here . The tutorial can also be found at Elizabeth Craft Designs here. Hope that you have enjoyed this post and that you visit Elizabeth Craft Designs real soon to see all the great products they offer. Today’s post is a card I did for Elizabeth Craft Designs – Susan Tiereny Cockburn’s Design Team which was posted on Elizabeth Craft Designs Blog back in August. 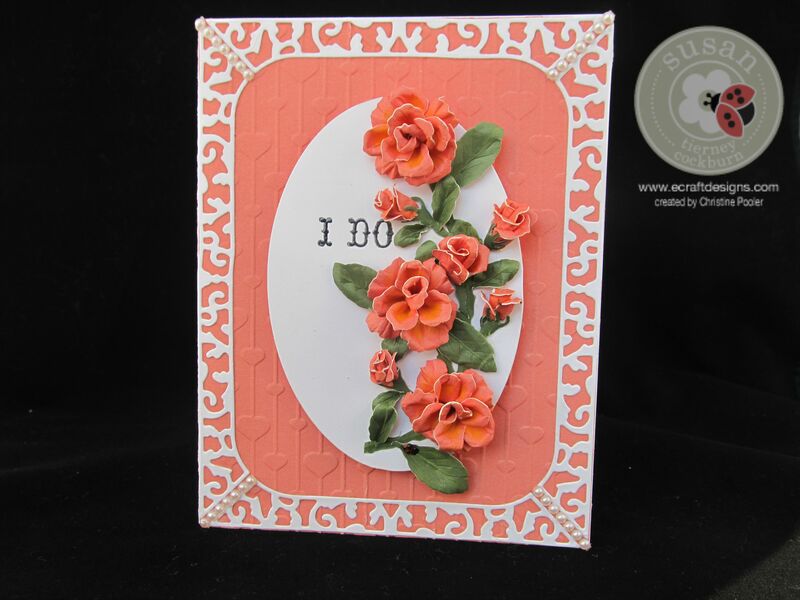 The tutorial for this card can be found here . You must visit Elizabeth Craft Designs website here to see all the great products. Thanks for visiting my blog and check back often for new posts. Today’s post is my latest creation using Susan Tierney Cockburn’s new chrysanthemum die which is now available here at Elizabeth Craft Designs. My card is a standard A2 card (4-1/4″ x 5-1/2″) using it as a top fold card. Let’s get started. Take your card base and using the Lots of Dots embossing folder emboss the lower two thirds of the front of the card case. Cut green cardstock 2-1/4″ x 5-1/2″ and white cardstock 1-1/2″ x 5-1/2″ then using edge punch (an older Martha Stewart punch used here but most any edge punch will work) punch one of the 5-1/2″ edges on each piece. 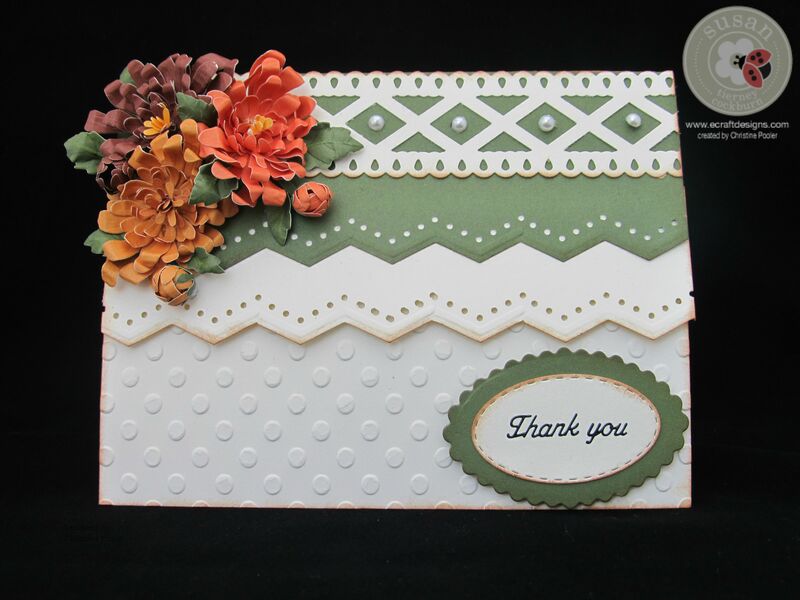 Cut white cardstock 1-1/2″ x 5-1/2″ then punch using Martha Stewart Diamond Fence double edge punch. Using the 2 smallest oval dies from the Accordion Oval die set cut the smallest oval in white cardstock and the larger of the two dies cut in green cardstock. Ink all edges of your card base and all the pieces you have cut. Vintage Photo Distress Ink was used here. 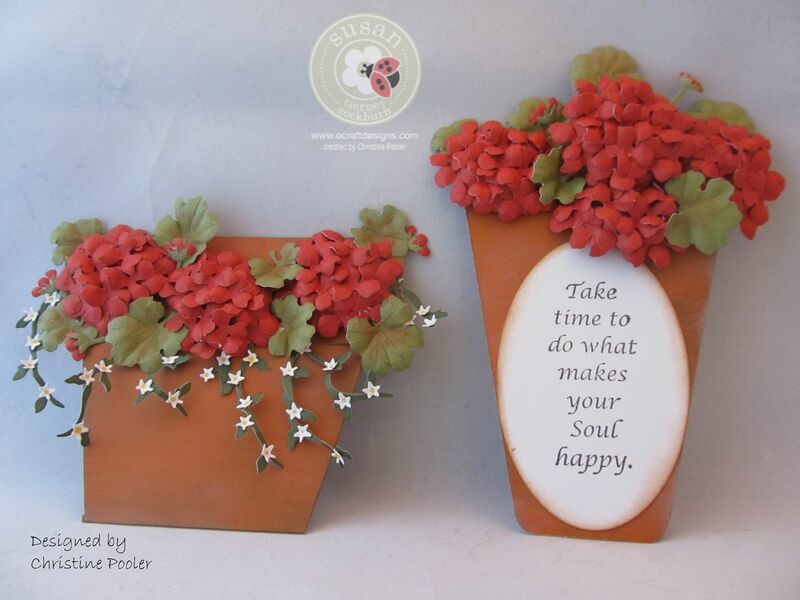 Using shades of orange, red and yellow cardstock cut your flowers using Susan’s Garden Notes die Chrysanthemum. For each flower I cut everything twice including the stamens. 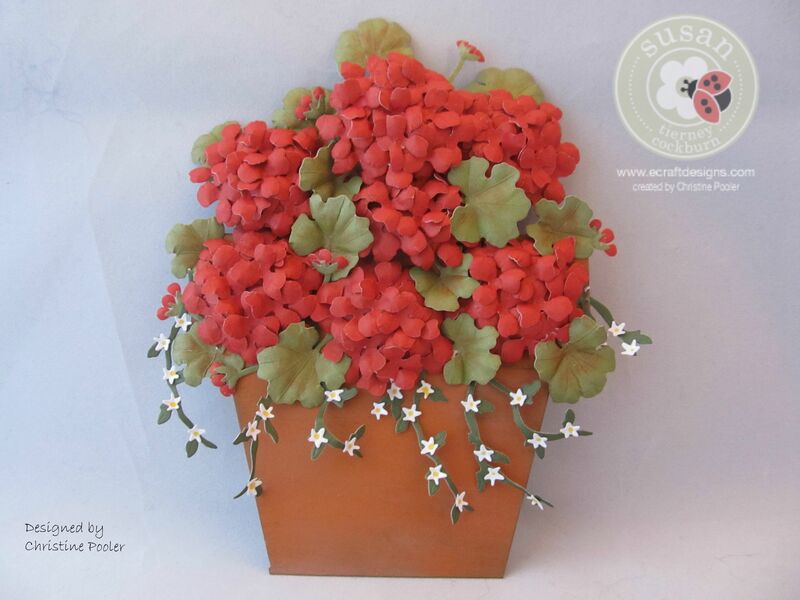 Using Susan’s Deluxe Tool Kit and Molding Mat shape your flowers. The loop tool and tweezers were used to shape these flowers. Starting with the largest set of petals stack the petals gluing between layers (2 large, 2 medium and 2 small). Using the ball tool gently curve the stamens, glue them end to end and then using tweezers roll holding for a few seconds to dry then fluff the stamens out. Glue to center of “mum”. Cut two of the smallest petal layers for each bud. Using medium ball stylus and molding pad place petals wrong side facing up press ball tool into center and stir causing the petals to curve up tightly. Glue one on top of the other and pinch back together forming a bud. From green cardstock die cut your leaves. Using Susan’s leaf tool and leaf pad make the vein lines on your leaves, add green PanPastels pinch base of leaf and shape the leaf tip with ball tool. (Susan’s You Tube video for her Rose 2 die will help you with your shaping etc.) See it Here. Using Thank You from ECD Black Peel Off Stickers – Text set place on the small white oval. Adhere the white oval to the green oval. Assemble Card by taking the green 2-1/4″ x 5-1/2″ piece of cardstock and using ECD clear double sided adhesive along the top attach to card base. Add the double sided adhesive to the top back of the white 1-1/4″ x 5-1/2″ piece of cardstock underneath the green adjusting so it is evenly spaced. Take the white doubled edge punched piece and using clear drying glue adhere over the green at the top of the card. Add your flowers, buds and leaves to the top left corner using a clear drying glue. Using pop dots adhere the oval to the bottom right corner. Place pearls in the diamond spaces across the top. I do hope you have enjoyed my card today and you try your hand at creating one. Remember that most edge punches will work and will change it up a bit. Hope you are having a great Labor Day weekend! the weather here in Maine is just great. Here is another version I am posting another version of the Fall Mums. 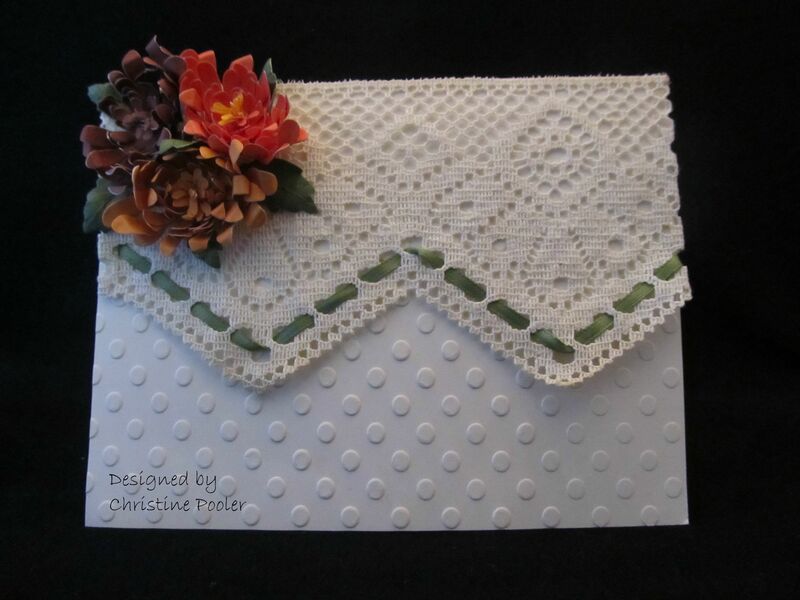 It is a similar card but instead of using edge punches I used a piece of antique lace and some ribbon. Susan’s new die Chrysanthemum was used as well as Elizabeth Craft Designs Lots of Dots embossing folder and their double sided clear adhesive. Enjoy!